Will this spark off the demise of renewables? The map below shows the areas of the UK currently licensed and under consideration for licensing. Enter your postcode and see if your neighbourhood is at risk from fracking. Because these kinds of policies appear in no one’s manifesto, and no one would seek to defend them in public, they are a classic indicator of political corruption. By this I mean operating on behalf of unrevealed and particular interests, rather than on behalf of either the constituencies that elected you or of the nation as a whole. Excellent presentation of the limitations of uk fracking regulations for when someone says something like… in the uk our regulations are so much better than the rest of the world. 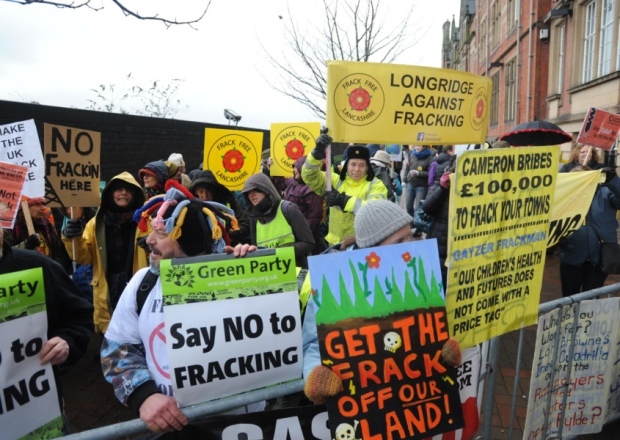 Lancashire anti-fracking campaigners are concerned that fracking could still go ahead in Lancashire because the County Council approved a part of Cuadrilla’s two planning applications. Cuadrilla was famously denied permission to carry out any fracking in Preston in June this year. They have since announced that they are going to appeal the council’s decision. Fracking was all the rage between 2009 and 2014. The euphoria that enshrined this “new” industry was palpable in the wake of the 2008 credit crunch, as investors clamored for the next economic savior. Hydraulic fracturing was supposed to be it. Oil and Gas authority confirms 27 development blocks to be offered to companies, while 132 further blocks undergo environmental assessments.